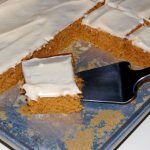 A moist pumpkin cake with homemade cream cheese frosting. CAKE: Preheat oven to 350 degrees. Grease and flour a 15 x 10 x 1-inch jelly roll pan. In a large bowl, beat pumpkin, sugar, and oil. Add eggs one at a time, mixing well after each addition. In another bowl, combine flour, soda, salt and spices. Add dry ingredients to pumpkin mixture, beat well. Pour batter into prepared pan. Bake for 25-30 minutes or until cake tests done with a toothpick. Cool on a wire rack, in the pan. FROSTING: In a large bowl, beat cream cheese, butter, and vanilla, until smooth. Gradually add confectioners' sugar, mixing well. 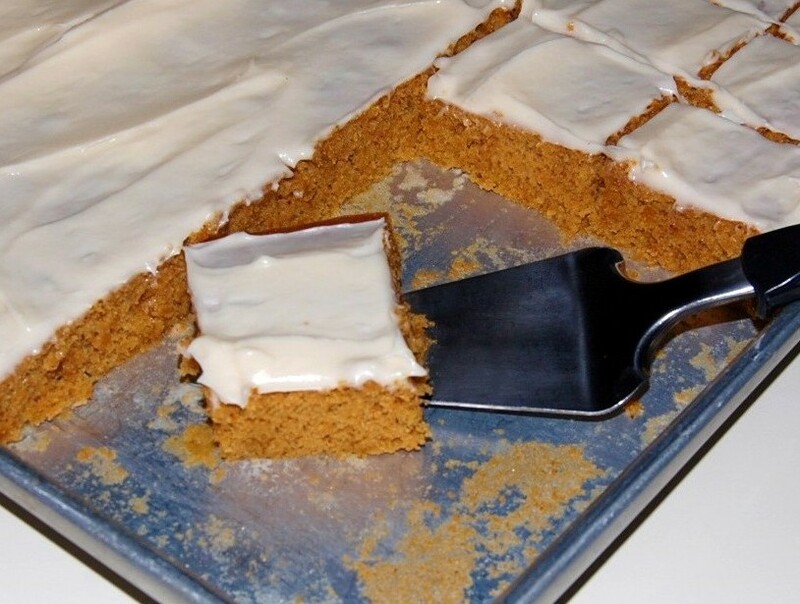 Add milk until frosting reaches desired thickness. Frost cooled cake, sprinkle with chopped nuts or decorate with candy corn pumpkins, if desired.